Velachery is a residential neighbourhood in South Chennai. The name comes from Vel in Tamil meaning King and Cheri meaning a place where people live together. In 2005, the widening of the Bypass Road into a six-lane road transformed Velachery into a prime residential locality in Chennai. It has IIT-Madras in the north-east, Taramani in the east, Adambakkam in the northwest and Pallikaranai Marshland in the south. Other neighbouring areas include Thiruvanmiyur, Guindy, Adyar, Perungudi, and Madipakkam. According to a report by Cushman & Wakefield, this locality is projected to be one among the Main Street retail hubs in the city. Velachery offers mid-range and luxury apartments though the locality also has independent houses as well. Apartments in Velachery are sold at Rs 6,000-Rs 6,800 per sq ft.
Velachery has good road connectivity with MTC plying buses between the locality and the rest of the city. Vijayanagar Bus Terminus is the major bus stand in the Velachery locality. 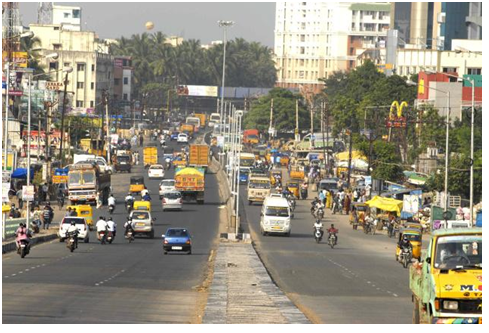 There are three arterial roads: Velachery Main Road, Taramani Link Road, and Velachery Bypass Road. The 100 feet Bypass Road connects Guindy on the northwest.TheVijayanagar junction is one of the most important junctions in the city.The Taramani link road on the north east connects Velachery with Rajiv Gandhi Salai (OMR). The railway stations in Velachery connect to Old Mahabalipuram Road, East Coast Road, Besant Nagar and Marina Beach. The St Thomas Mount railway station is about 2-5 kms westwards from Velachery. ChennaiInternational Airport is about 9-10 kms away from Velachery. MTC operates direct Volvo buses between the Airport and Velachery. Westin Chennai, ITC Grand Chola and Park Hyatt are some of the new hotels in the locality. The Phoenix Market City mall and the PS Srijan Grand Mall attract a lot of people. The American Advent Mission School has been functioning since the 1950s. Some of the schools in the locality include Guru Nanak Matriculation HS School, Sivasakthi School, Bethel Matriculation HS School, and LakshmiVidyalaya among others. The colleges include Gurunanak College on Velachery Main Road, Jerusalem College of Engineering and Balaji Dental College and Hospital. Velachery aeri or lake, is nestled between Velachery and Adambakkam and was once an important source of drinking water to people in the neighbourhood. The Velachery Aquatic Complex, built as a South Asian Games venue in 1995, is a swimming pool complex which seats 4,000 people. The pool is open for memberships by the public and offers concessional coaching to medal winners. Looking to buy your new home or perhaps a good rental investment? RoofandFloor has great listings for projects in Velachery. Your dream property is just a click away.